This entry was posted in Auto Repair, Home Improvement. Bookmark the permalink. You are driving happily down the road, when all of a sudden, out of nowhere, a rock hits your windshield creating a "bullet crack." Nothing is more frustrating than an unexpected broken windshield, but unfortunately, it happens. Rocks have no mercy; your car could be one day old or 50 years old. Luckily, windshield repair or replacement is a well established science. A company called Safelite specializes in windshield repair or replacement only. According to Safelite, the company started operations in 1947, operating out of a shop in Wichita, Kansas. The company grew steadily over the years so that in 2011, an entire mobile fleet is nationwide. You don’t have to bring the vehicle to them and leave in a shop. Safelite comes to your residence or work, and repairs or replaces the windshield while you are working or going about your business. Chemists and researchers have always researched and investigated adhesives. In 2011, the chemicals used to repair or seal glass is also a well developed science. Safelite uses special adhesives to seal a bullet crack. The sealants themselves have the same light reflecting properties of glass, so the repair becomes invisible or close to it. Safelite points out that a bullet crack repair may not be 100 percent invisible, but a slight blemish may still be visible. If the windshield has to be replaced, Safelite states it uses state-of-the-art adhesives, which cure in about an hour. You ultimately have to make the decision to repair or replace your windshield. You have to use a little common sense here. If its just a simple little bullet crack, repair it early, so it doesn’t run. If you ever saw a windshield with long streak cracks radiating out like crooked spokes off a central hub, it started out as a bullet crack. The quicker you get it taken care of, the better. If the windshield is significantly cracked because of hail damage, of course the only thing to do is replace. When you are making the decision to repair or replace, insurance plays into the equation. You have to read through your policy, to determine if any deductibles are in force. Also, insurance may cover bullet crack repair only, but not replacement if its just a little crack. Safelite states it will work with your insurance company to fix your windshield. OEM stands for Original Equipment Manufacturer. OEE stands for Original Equipment Equivalent. OEM is the original windshield that was installed on your vehicle when it left the factory. OEE is the equivalent windshield, but manufactured by an aftermarket company. The difference between the two gets confusing and intermingled, since many auto manufacturers do not make their own windshields. Rather, they sub-contract a large glass company to make windshields for them. This is akin to a vehicle manufacturer installing a tire company’s tires on their factory assembled vehicles. 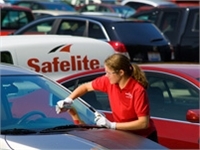 Safelite states it uses OEE windshields, made to the exact specifications as the original. Safelite does not have a one-size-fits-all pricing. They will come out to where the vehicle is located, and issue a quote according to what they find. Safelite states it accepts cash, checks, and all major credit cards. If a claim is filed, Safelite will bill your insurance company. To fully understand the Safelite company, look over their website. It’s pretty extensive, and has a "frequently asked questions" section. Links are arranged across the top, with dropdown lists.You can also call or write their customer service department, if you have any questions or concerns not answered on their website.